It's powered by a Euro 4 compliant liquid cooled 1,050cc 75° V-Twin engine, producing 123.4bhp at 8,500rpm and maximum torque at 6,500rpm. Over the £11,300 1090 Adventure you get off-road focused larger wire spoked wheels, knobbly tyres, a smaller screen, orange frame with crash bars, 40mm taller seat, beefier and adjustable 48mm fork with 35mm more travel and 30mm more rear travel however it's 2kg heavier. You can even have it restricted to 47bhp for an A2 licence. The 6 split spoke 21" front wheel takes a Continental TKC 80 Twinduro 90/90 tyre and the rear 18" a 150/70 while the service interval is a shade over 9,000 miles. 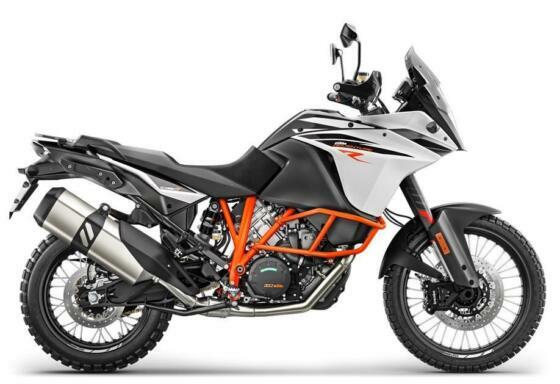 Options include a skid plate (£233), headlight protector (£74), radiator grill (£66), Akrapovic slip-on muffler (£835), orange rear sprocket (£83), heated grips (£166), rider/pillion heated seat (£208), comfort seat (£141), tall screen (£108), centre stand (£166), LED foglights (£392), 36+30 litre panniers (£832) and 36 litre top box (£417).